I strive to develop my expertise driven by what interests me. I love playing with sugar so confectionery holds a special place in my heart. On the other hand, tempering chocolate is a task I do not enjoy. You would think with my accurate Thermapen to take the guess work out of the way, tempering chocolate would be an easy task. I just simply don’t enjoy it. I tempered chocolate at home exactly twice since I finished my chocolate course in culinary school. I go out of my way to avoid the task ever since. Among my group of cooking friends (the same cast of characters that co-produce Pie Day, Cake Day, Waffle Bar, Cookie Day), each of us are known for our different expertise. Some are stronger bakers while others excel in savouries. 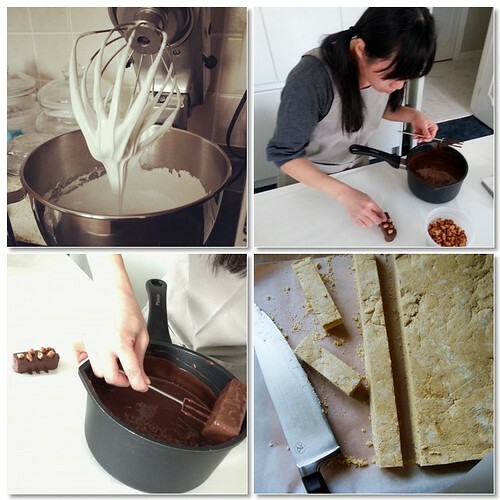 Foodpr0n is known for her chocolate treats. Her homemade holiday gifts usually include some sort of chocolate covered goodies and they are not to be missed. I was so happy she didn’t mind me piggyback on her moon pie project! I thought of enrobing a batch of homemade marshmallows. Since my first batch of matcha kinako marshmallows, I went on to make marionberry amaretto and fresh ginger flavour ones as well. I have a whole line up of flavours to experiment including malted cocoa, mango coconut, and strawberry orange flower water to name a few. I went through my bookmarked recipes in The Liddabit Sweets Cookbook and honestly couldn’t stop myself from trying new recipes. 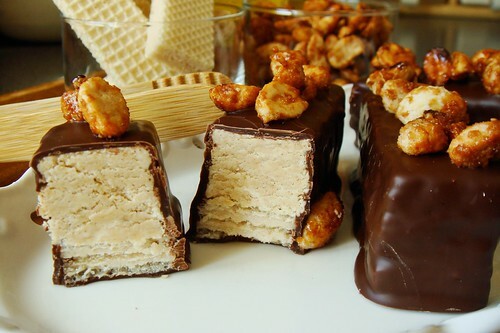 The first recipe that caught my attention was Fluffy Peanut Butter Nougat (recipe is online at Google Books). It combines skills I already know (making Italian meringue) with familiar ingredient (commercial peanut butter) to create something that I never tried before. The surprising aspect intrigued me. The recipe itself is simple enough. Make Italian meringue with sugar syrup cooked to hard ball stage. Fold in salt and warm peanut butter. Set for 2-3 hours and cut. The mixture seizes as soon as peanut butter is added so it is crucial to work quickly. My imagination quickly wandered. 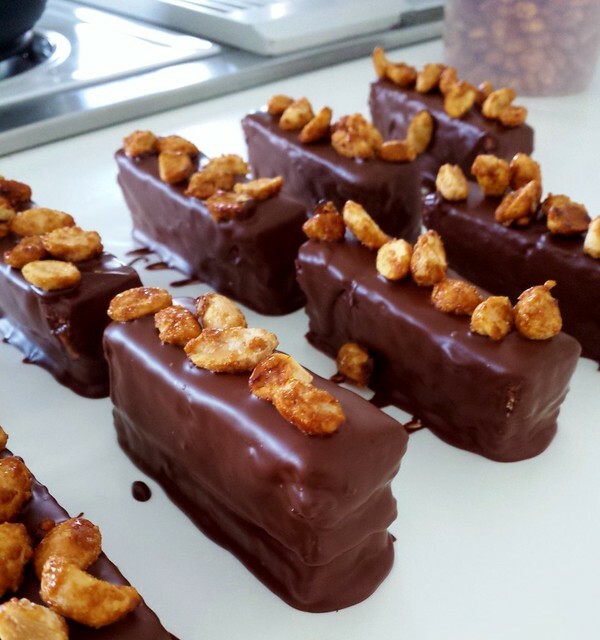 What can I do with a batch of fluffy peanut butter nougat? At Liddabit Sweets, it is a key component of The King Bar. I decided to set mine on top of vanilla wafers and homemade spicy peanut caramel. 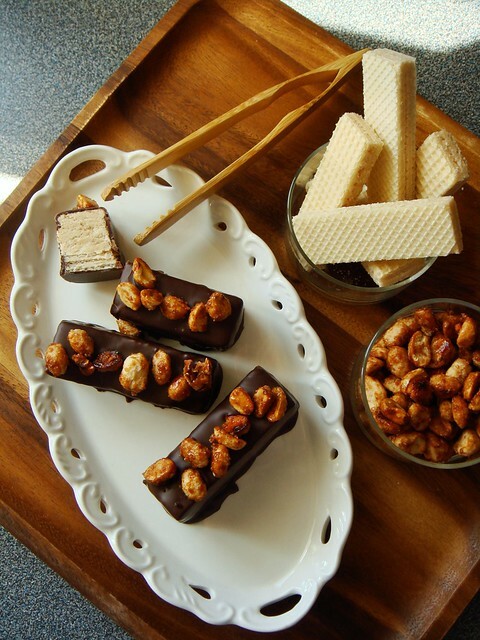 Enrobe the whole thing in dark chocolate and garnish with homemade candied peanuts. I don’t have a catchy name for the treat but my friends suggested The Candy Bar. What do you think? I chose my wafers carefully for just the right size. I lucked out with finding ones that are just a bit bigger than typical “fun size” chocolate bars. 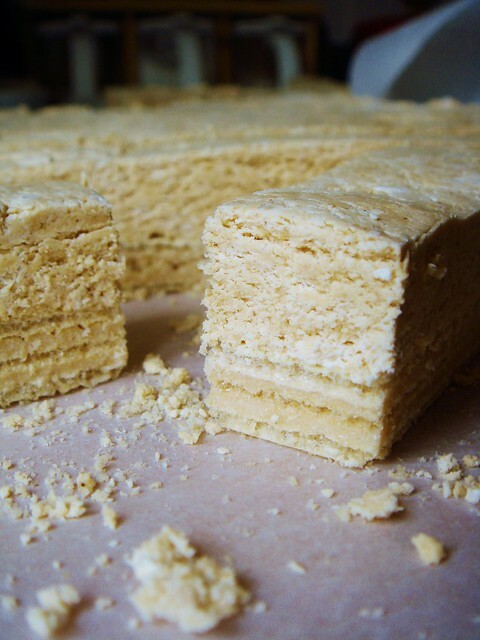 When I cut the nougat-topped wafers, I sliced along the pre-cut lines to avoid excess crumbling. The bars turned out beautifully sliced. 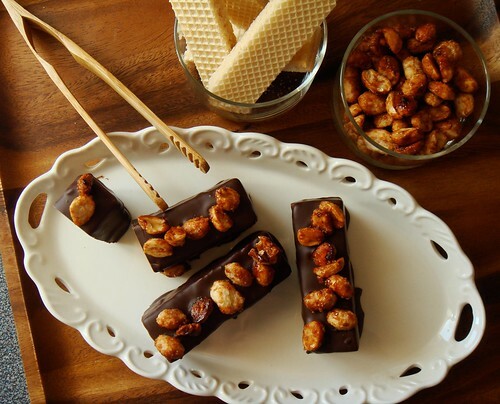 Thanks to foodpr0n’s tempering expertise, each Candy Bar was wrapped in shiny dark chocolate. What an addictive little treat! I love the crispy wafer. I love the fluffy crumbly peanuty nougat. I love the snap of the dark chocolate. I love the crunchy candied peanuts. 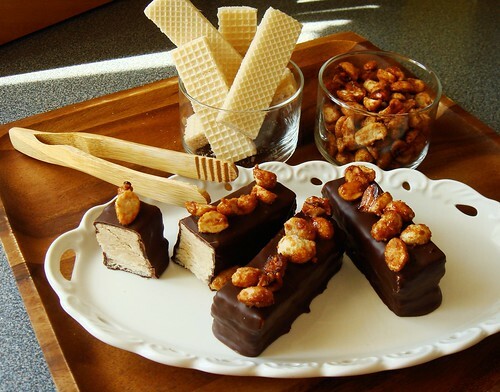 My friend said they reminded her of Little Debbie’s Nutty Bars in an indulgent homemade way. Unlike baked goods, they keep well! It was ridiculously fun to make and allowed my sugar-filled imagination to run wild. I think it is about time I brush up my chocolate tempering skills for further exploration into the world of confection.